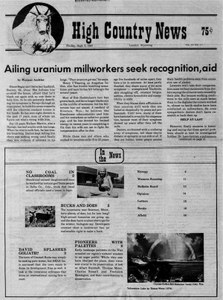 Millworkers helped produce uranium for the nation's nuclear defense program in the 1950s and '60s. Now many are ill from exposure to radiation, but getting compensation is difficult. Less than a month after Crested Butte, Colo., passed an ordinance aimed at protecting its watershed, city leaders find themselves face to face in court with AMAX, the mining giant that hopes to extract molybdenum nearby. In a break with tradition, the school district in one of western Colorado's most productive coal regions is building seven new schools, all of them to be heated with natural gas, an imported commodity.